Stress: a condition or adverse circumstance that disturbs, or is likely to disturb, the normal physiological or psychological functioning of an individual. We all experience stress. Whether it is a major life event like moving to a new city or a list of minor daily irritations like traffic jams and noisy neighbours, stress is a daily companion for many people. For people with arthritis, the additional anxiety, frustration, and pressure caused by living with disease can add to the stresses of daily life and seem overwhelming. In this issue of JointHealth™ monthly, we look at causes of stress, the impact that stress can have on your body, and how having arthritis fits into the picture, and we provide some healthy strategies for dealing with stress. Also included, by reader request, is a spotlight on scleroderma. In addition to major life events like these, everyday minor irritations—like dealing with rude people or misplacing your car keys on the way to work—can also feel stressful. It is important to note that what causes stress in one person may not faze another; in other words, the things we find stressful, and our responses to them, are different from person to person. For decades, scientists have understood that emotional stress has a physical impact on human beings. Psychological stress causes the body to increase production of certain hormones, and may impact on a number of areas of the body. Studies have also shown that stress can decrease pain tolerance, which makes it more difficult to deal with a painful chronic disease like inflammatory arthritis. In fact, some researchers believe that stress may even cause flare-ups of disease activity in people living with inflammatory arthritis. All of this adds up to a vicious cycle for people who live with arthritis: research indicates that emotional stress may trigger or worsen the physical symptoms of arthritis, and having arthritis can cause extreme emotional stress. 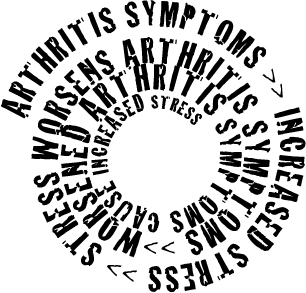 In other words, arthritis causes stress, and stress can worsen arthritis. Try making a list of your stressors. Often, people with arthritis can feel overwhelmed by the range of difficulties they face. Making a list may show you that the things that are stressing you are more manageable individually than they are as a group. Get as much sleep as you can. Lack of sleep can increase stress, and make it more difficult to deal with existing issues. People with arthritis often report difficulty sleeping, because of pain or stiffness when lying down. To sleep better, try keeping a regular bedtime, avoiding caffeine and alcohol late in the day, and controlling your nighttime pain by adjusting your medication routine-in consultation with your doctor-so that your pain is controlled at night. For more tips on dealing with sleep and fatigue issues, see the June 2007 issue of JointHealth™ monthly. Do your best to eat well. Foods that are high in fat, sugar, and salt are bad for your body and can make it difficult to deal with stress. For many people with arthritis, eating well is a major challenge. Getting out to shop for fresh foods, navigating the supermarket, and cooking meals can all be difficult—or nearly impossible—and often people with arthritis find themselves depending on packaged convenience foods. If grocery shopping is difficult, consider online shopping—many supermarkets now offer home delivery for a small fee. To solve problems in the kitchen, a number of adaptive devices are available to minimize the need for bending, reaching, and gripping in the kitchen. For more information about eating well with arthritis, please see the December 2006 issue of JointHealth™ monthly. Try to exercise as much as you are able. Doctors and researchers agree that exercise can be an incredibly helpful tool to reduce and manage stress, but people with arthritis often face extra challenges in this regard. Doctors, physiotherapists, and other health care professionals are terrific resources in this area. Depending on the type of arthritis, joint involvement and levels of joint damage, these professionals can help design a well-balanced exercise plan. Work on maintaining good communication with those closest to you. Poor communication with those close to you can be a significant source of stress. For people with arthritis, disease tends to add another layer to this issue. It can be very difficult for people with arthritis, especially those who are newly diagnosed, to share their needs, and challenges, and experiences with disease with those around them. Work on making your requirements known in clear, simple language, and try to let those around you know what kind of help you need, and what kind you do not. For more information about communicating with loved ones, see the January 2007 issue of JointHealth™ monthly. Know your limits. Try to remember that people who live with arthritis, especially those whose disease is not yet well-controlled, may face limitations. While this can be incredibly frustrating, it is important to respect —for example, a person who has been recently diagnosed with inflammatory arthritis may not be able to accomplish all the things they are used to getting done in a day. Take frequent rest breaks, listen to your body, and manage your expectations—and those of your family, friends, employers, and colleagues. Do your best to banish guilt. Feeling guilty can cause stress and depression. People with arthritis often say that one of the most difficult aspects of living with disease is the guilt they feel when they are unable to fulfill commitments to those around them. Parents who cannot take their children to the park, workers who have to take more sick days, spouses who are too tired or sore to be intimate with their partners—in many areas of life, arthritis can cause feelings of guilt. Try not to be hard on yourself—remember that these limitations have been caused by your disease, not who you are as a person. Try taking a deep breath. Increased oxygen can have a calming effect. Deep breathing, meditation, and yoga are known to reduce stress. While certain yoga positions may be impossible with arthritis, many yoga teachers are able to provide modified routines to accommodate stiff, sore, or fused joints. Though you may not feel like it, try to make socializing a priority. Spending time with family or friends can significantly reduce stress. People with arthritis can sometimes become isolated due to reduced ability to participate in social events. Try to find ways to keep yourself socially active. Try organizing get-togethers around your schedule—choose times of day when your arthritis is generally less active, and plan events that will not be too taxing. For example, instead of hosting a family gathering and committing to doing all the preparation yourself, organize a potluck and enlist help for clean-up. Try not to let stress keep you from managing your disease. Following your treatment plan, including taking prescribed medications, is of paramount importance. Living with high levels of stress can make it difficult to stay on top of all of the elements of a comprehensive treatment plan, but it is vital. Try to think of your treatment plan as the most important "stress-buster"—managing your disease may prove to be the best way to manage stress overall. Scleroderma is an autoimmune rheumatic disease in which skin of the extremities, chest, abdomen, and/or face becomes thick and hard. Joint pain and stiffness, particularly involving the hand joints, is almost always present at disease onset. Scleroderma occurs when the body's immune system begins to malfunction and attacks healthy tissue in various parts of the body, causing inflammation and damage. The most common tissue affected by scleroderma is the skin. When the immune system attacks the skin in scleroderma, the body responds by producing too much collagen, resulting in a thickening and hardening of the skin-the word scleroderma literally means "hard skin". In some forms of scleroderma, internal organs are also affected. Scleroderma affects about 15,000 Canadians—approximately one in 2000. Like many other forms of arthritis, scleroderma occurs more commonly in women than in men-women develop scleroderma approximately four times more frequently than men do. Scleroderma affects people of all ages, from babies to the elderly, but it tends to occur most often between the ages of 45 and 65. While the exact cause or causes of scleroderma remain unknown, some research indicates that people with a family history of scleroderma or other rheumatic autoimmune diseases, like rheumatoid arthritis, may be at a higher risk for developing scleroderma. As well, some researchers believe that frequent exposure to solvents and heavy metals—for example, people who work in manufacturing or refining plants—may increase the risk of developing scleroderma. Diffuse scleroderma- the most serious form of the disease, characterized by rapid progression of skin thickening to include the upper arms, thighs, chest, and/or abdomen. In this form of the disease, there is often significant internal organ involvement, particularly of the lungs, intestine, heart, and kidneys. Limited scleroderma- skin thickening restricted to the fingers, hands, and forearms, which does not progress beyond these areas. This disease sub-type was previously known as the CREST syndrome, but physicians now recognize that this term does not accurately separate diffuse from limited scleroderma. Scleroderma sine scleroderma-a form of systemic scleroderma in which skin thickening is absent but other features (internal organ involvement, blood antibodies) are characteristic of scleroderma. Morphea-characterized by round or oval patches of rough, hardened skin most often appearing on the chest and abdomen, though arms, legs, and face may also be involved. Linear-characterized by a line or streak of thickened skin most often appearing on the torso, arms, or legs, though sometimes linear scleroderma can appear on the face or neck, particularly in children. Skin thickening penetrates through the skin underlying fat, rarely affecting the bone. Children and teenagers who develop scleroderma more often have the linear type of the disease. It is important to note that not all people with a particular type of the disease will necessarily develop all of the problems associated with that type. If your doctor believes you could have scleroderma, you will usually be referred to a rheumatologist—a specialist in the treatment of scleroderma and other diseases which affect joints. Rheumatologists have additional training and experience in the diagnosis and treatment of scleroderma and related conditions. The diagnosis of scleroderma is based on a combination of medical history, physical examination, and laboratory test results. Blood antibodies characteristic of scleroderma are important. Additional diagnostic tests should be performed to determine if there is involvement of the intestine, lungs, heart, or kidneys. Once your rheumatologist has confirmed the diagnosis of scleroderma, there are treatments available which vary depending on the form of the disease. There is no known cure for scleroderma, and treatments therefore focus on controlling symptoms. Potential disease-modifying anti-rheumatic drugs (DMARDs), such as D-penicillamine, mycophenolate mofetil (CellCept®), and methotrexate. Other medications may be used to treat the complications of scleroderma, such as high blood pressure, heartburn, and bowel problems. The goal with these medications is to bring symptoms under control and slow the progression of the disease, as well as to prevent or minimize damage to internal organs. In patients with scleroderma, particularly limited scleroderma, regular monitoring should be done for pulmonary hypertension (high blood pressure in the lungs). This cannot be tested with a blood pressure cuff. An ultrasound of the heart (echocardiogram) should be done every 6 to 12 months in most patients with limited scleroderma to look for early signs of this treatable complication. And finally, maintaining a healthy lifestyle is also a critical part of any scleroderma treatment plan. Poor diet and high levels of stress may worsen the disease, so healthy eating and relaxation are highly recommended. ACE thanks Dr. Thomas A. Medsger Jr. of the University of Pittsburgh for his scientific review of this article. Dr. Medsger is a world-recognized scleroderma researcher.